The movers just left with our rental furniture (I'm typing on the floor.) Returning at 1:00 with our shipment!! Last night we all shared what we're most excited about having from the shipment - Eva said her Hello Kitty slippers. Audrey said yehyow nonga (hmmm translated that means yellow blanket. must be one from her imagination.) Bryce said his bike. For me it's the feeling of home. 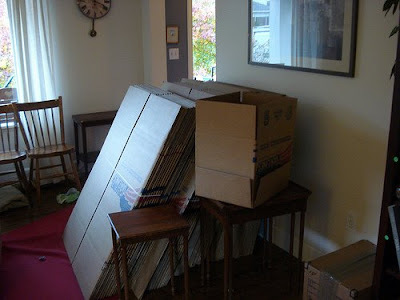 Here's a picture from moving day in Seattle. YEAH!!! I am sure it will be wonderful. I didn't realize that you would be shipping all your furniture over, I just assumed the house you were in would be furnished. But I am sure it will be much nicer with your own things!! ENJOY! "Must be one for the imagination." LOL-this cracked me up! Very exciting!